TextCrunch provides Singapore copywriting and content marketing services. We help businesses create clear and compelling copy for their target audience. Effective and compelling, enabling your message to come across loud and clear. Persuasive and targeted, making you more likely to close a sale. In a tone and language which identifies with your brand values. Easy to understand and free of spelling and grammar mistakes. Search-engine optimised to improve your website’s search performance. Outsourcing your content development increases your productivity. You benefit from having professionally-written copy while freeing up your time and allowing you focus on other tasks. We can write a broad range of content such as newsletters, brochures, SEO copy, website content, landing pages, thought leadership articles, feature articles, press releases and many more. Whether you are looking to revamp your web copy, create an informative product, or adopt a more creative approach to your storytelling, let us help you. 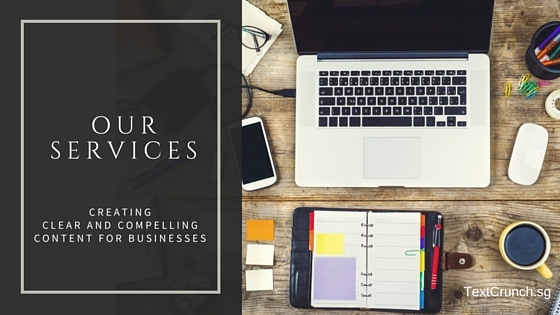 We’ll work with you to define your key messages and bring your copy to life.